by Bedient, Philip B.; Huber, Wayne C.; Vieux, Baxter E.
For courses in hydrology and hydraulics. 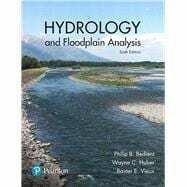 Hydrology and Floodplain Analysis , 6th Edition offers a clear and up-to-date presentation of fundamental concepts and design methods required to understand hydrology and floodplain analysis. The text addresses the computational emphasis of modern hydrology and provides a balanced approach to important applications in watershed analysis, floodplain computation, flood control, urban hydrology, stormwater design, and computer modeling. Three main sections guide readers through the material, while examples, case studies, and homework problems reinforce major concepts. The 6th Edition includes brand-new chapters that cover geographical information systems (GIS) and the latest advances in computer modeling applications, along with new and updated examples and case studies. Philip B. Bedient is the Herman Brown Professor of Engineering with the Department of Civil and Environmental Engineering, Rice University, Houston, TX. He received the PhD degree in environmental engineering sciences from the University of Florida in 1975. He is a registered professional engineer and teaches and performs research in surface hydrology, modeling, and flood prediction systems, and ground water hydrology. He has directed over 60 research projects over the past 41 years, and has written over 200 journal articles and conference proceedings over that time. He has also written four textbooks in the area of surface water and groundwater hydrology. He received the Shell Distinguished Chair in environmental science (1988—92), the C.V. Theis Award in 2007, and he was elected Fellow of ASCE in 2006. Dr. Bedient has worked on a variety of hydrologic problems nationwide, including river basin analyses, major floodplain studies, flood warning systems, groundwater contamination models, and hydrologic/GIS models in water resources. He has been actively involved in developing radar-based flood prediction and warning, and recently directed the development of a real-time flood alert system (FAS3 and FAS4) for the Texas Medical Center (TMC) in Houston. He has built real-time flood alert systems for several communities across Texas. He currently directs the Severe Storm Prediction Education and Evacuation from Disasters (SSPEED) Center at Rice University, a five-university research organization with private and public entities that predicts and assesses the impacts of severe storms and floods near the Gulf Coast. This center is devoted to developing real-time flood alert and surge alert systems for the coastal areas around Houston such as the Houston Ship Channel, and also evaluates structural and nonstructural methods for mitigation of severe storms. Dr. Bedient has received research funding from the U.S. EPA, the U.S. Department of Defense, NSF, the State of Texas, the U.S. Army Corps of Engineers, the City of Houston, and the Houston Endowment. Wayne C. Huber is Professor Emeritus of Civil and Construction Engineering at Oregon State University, Corvallis and Senior Consultant with Geosyntec Consultants, Portland, Oregon. His doctoral work at the Massachusetts Institute of Technology dealt with thermal stratification in reservoirs, for which he received the Lorenz G. Straub Award from the University of Minnesota and the Hilgard Hydraulic Prize from the American Society of Civil Engineers (ASCE). Additional awards include the ASCE Environmental and Water Resources Council Julian Hinds Award. He is a member of several technical societies and has served several administrative functions within the ASCE, including service as Associate Editor of the Journal of Environmental Engineering since 2007. He is the author of over 120 reports and technical papers, is a registered professional engineer, and has served as a consultant on numerous studies done by public agencies and private engineering firms. He has served on several review committees of the National Academy of Sciences, including serving as chair of the Committee on Independent Scientific Review of Everglades Restoration Progress. Beginning at the University of Florida and continuing at Oregon State University, Dr. Huber’s research has included studies of urban hydrology, stormwater management, nonpoint source runoff, river basin hydrology, lake eutrophication, rainfall statistics, and hydrologic and water quality modeling. He is one of the original authors of the EPA Storm Water Management Model and helped to maintain and improve the model following its 1971 introduction. Dr. Huber is an internationally recognized authority on runoff quantity and quality processes in urban areas. Baxter E. Vieux is Professor Emeritus in the School of Civil Engineering and Environmental Science, University of Oklahoma, Norman. He taught courses in hydrology, environmental modeling, GIS applications, water resources, and water quality management after joining OU in 1990, until 2013. Prior to his academic career, he spent 10 years with the USDA Natural Resources Conservation Service (formerly SCS) in Kansas and Michigan, with his highest position as Assistant State Engineer and Acting State Engineer. He is a registered professional engineer in several states and is co-principal and founder of Vieux & Associates, Inc., an engineering technology company with clients in radar-based hydrology. Dr. Vieux is the innovator and architect of the first commercially available physics-based distributed hydrologic model, Vflo®, which was designed from the outset to use high-resolution maps of terrestrial parameters and radar rainfall. He has authored over 110 publications in hydrology including Distributed Hydrologic Modeling Using GIS, 3rd ed., Springer Publishers, Norwell, Massachusetts, Water Science Technology Series, vol. 74. Dr. Vieux has developed and deployed radar-rainfall monitoring and runoff modeling technology for operational hydrologic forecasting services in the United States and internationally.